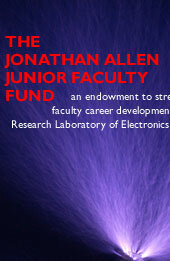 Jonathan Allen, Professor of Electrical Engineering in the Department of Electrical Engineering and Computer Science, was the sixth Director of the Research Laboratory of Electronics (RLE) at the Massachusetts Institute of Technology (MIT). A native of Hanover, New Hampshire, Professor Allen received the AB from Dartmouth College in 1956 and the MS from Dartmouth’s Thayer School of Engineering the next year. 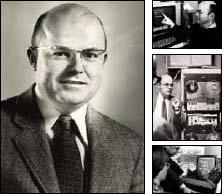 He worked at Bell Telephone Laboratories on the technical staff from 1962 through 1966 before becoming the supervisor of human factors engineering in 1966. He earned the PhD from MIT in 1968, and in the same year, joined the MIT faculty as Assistant Professor of Electrical Engineering. In 1972 he was promoted to Associate Professor, and in 1975 he was promoted to Professor. Professor Allen’s initial research focus was on speech processing and computational linguistics. In the mid 1970s, he shifted his attention to computer-aided design (CAD) techniques for the emerging field of very-large scale integrated (VLSI) circuits, becoming a leader in establishing a robust VLSI CAD activity at MIT. Professor Allen was appointed Associate Director of RLE in 1978 and became Director in 1981. He served as Director until his death in 2000.